Now, although the tradition is still more popular in American than in the UK, we celebrate a much more light hearted celebration and the night is purely one of spooky fun! Simple and inexpensive, but messy! All you will need is a large bowl (washing up bowl is ideal) lots of water, some green food colouring and some apples. Float the apples in the water, add a couple of drops of green colouring to make it more swamp like and then each child has to get an apple out without using their hands…..i.e. by trying to bite the apple with their teeth. It’s advisable to have towels on standby. Mix up a jelly in your largest mixing bowl and just before it sets up some ‘prizes’ into it, toy plastic spiders or well wrapped sweets would work well. If you then place an upturned cardboard box over the mixing bowl that has a hole cut in the top just large enough for a hand, each child will have to place their hand into the cold slimy jelly to reveal their prize. Hide a range of spooky items around your house, and then write a clue sheet to help the children complete the trail. Be imaginative, put things like ‘take a spider from the web’ where you have some plastic toy spiders suspended from cotton, or ‘gather some witches hair’ could be some cooked and cooled spaghetti that you’ve dyed green. Also at this time of year there are quiet often a variety of sweets that you can buy in the shape of vampire teeth, bugs and bats that could be included on your trail. Rather than doing party bags to hand out at the end of the party, you could give each child a bag to collect their trail items in that you then hand back to them as they leave, maybe after added a couple of extra treats. Find yourself a large piece of white card and an artistic friend! Draw the outline of a traditional looking witch, this can be as simple or as complex as your talent will allow as children are fortunately very kind at recognising things! Then draw a warty nose on a separate piece of card which the blindfolded children take turns in pining on the witch. If possible it is a nice touch to make a nose for each child that you write their name on in advance as then everyone can see the finished result at a glance without any claims of cheating! Think of the Andrex Puppy and you wont be far wrong. Split the children into teams of at least 2 with 1 child being the mummy and the remaining child(ren) armed with toilet rolls ready to wrap around the 1st child – the winning team being the first to make a mummy. Bit of an obvious one to have as your last game, a complete take off of sleeping lions and a chance to get your little ones to calm down a bit before they go home. The Vampire who wakes last from their sleep is the winner. If you are going to have a Halloween party, don’t forget a spooky cake! Here are 2 that I’ve made. 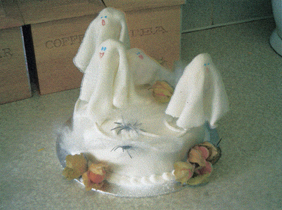 The ghosts on the white cake are just circles of white icing draped over lollies (chupa chups style lollies) or you can use upside down cornets instead. The webbing and spiders I bought in a halloween pack from a supermarket. Very easy to do. 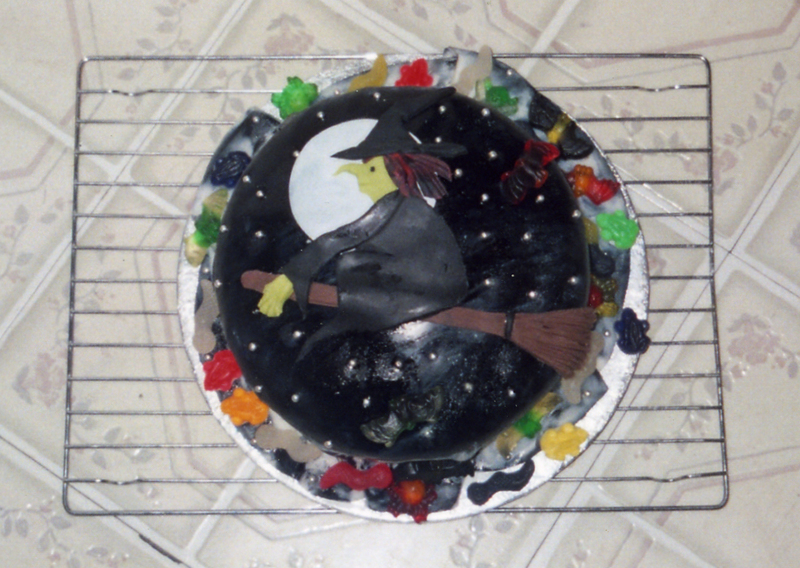 The black cake was a little trickier but essentially I drew the witch onto paper first, then cut it up to use as a template to cut out the right pieces from the coloured icing. Give them a try! While we’re dabbling in the area of Halloween Party Games MrsLJHall, Gaming is well-liked with teenagers, ladies, children, too as men. Older persons say they play games as it alleviates loneliness and puts them in contact with other people. Statistics reveal that 41% of gamers are ladies and a lot more than 43 % gamers are aged 25-49. And, research predicts that the games market in 2011 is going to be US$ 99 billion.